The city is giving $1 million to help a nonprofit trust acquire and protect the Pupukea Paumalu forest bluff on Oahu's North Shore. The Trust for Public Land will use the money to buy the 1,129 acres of oceanside land from Obayashi Corp. later this year and protect it from being developed. 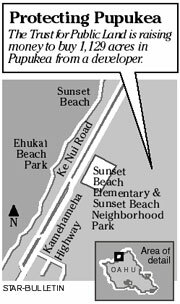 The Japanese company, which bought the land for $7 million in 1974, put the property on the market when proposed development of some 500 homes on the 400-foot-high bluff above Sunset Beach fell through recently. Josh Stanbro, Hawaii project manager for the trust, said his organization will partner with the city Department of Parks and Recreation and the Department of Land and Natural Resources' Parks Division to preserve the area. The land, between Paumalu Gulch and Pupukea Heights, borders popular youth camps and forms a scenic backdrop to surf competitions, television shows and movies. The Trust for Public Land and the North Shore Community Land Trust have already raised more than $800,000 in private donations and $7 million from federal, state, county and private sources. Last month, North Shore musician Jack Johnson auctioned off a guitar and gave the proceeds to the trust. The auction also displayed several surfboards signed by top professional surfers and a painting by Robert Wyland that was also signed by the marine wildlife artist.